This year's Womens Division had a record setting 12 teams participate in 2 divisions: Womens Open Elite and Womens Liberty. The Liberty Division featured Seattle Shibooyah crushing the competition by an average of over 20ppg, followed by the shocking Philly Lady Suns coming in at second place. These 2 teams then advanced into the Womens Open Elite. The remaining 4 teams competed in the Liberty Consolation playoffs. In the Semis, the Lady Sabres had a matchup with their partners in crime, the Sabres Girls. 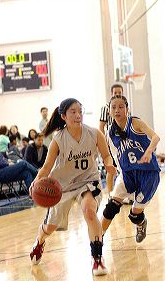 As expected the Lady Sabres moved on easily 29-10 as Maisie Wong had 7. The Lady Cruisers then faced the youngest team in the tournament, Toronto CCYAA B. NY jumped out 19-5 at the half before emptying the bench and finally winning 29-19. 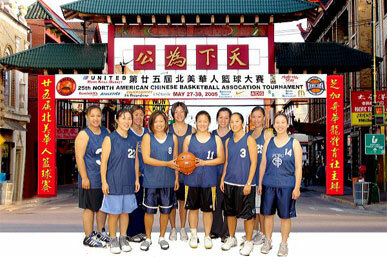 Top flight PG Angie Leung had 12 points for NY, and Jamie Yuen registered 6 for TO. In the Liberty Consolation Finals, the Sabres were looking for a repeat of their hard earned pool play win over the Cruisers. Things looked positive until Angie Leung hit a sick crossover juke em out 3 to give the Cruisers a 1 point lead right before the halftime buzzer. In the second half, neither team could produce much on the offensive end. The Cruisers tried to give the game away, by making a major blunder when they recklessly threw the ball away with just .2 seconds to go and leading by 1. The Sabres inbounded but could not get off a shot. The bottom line ended up being a comeback that fell short and a Cruisers 27-26 win. Angie had 10 for the Cruisers, and Tiffany Lee matched those efforts for the Sabres. The Womens Elite playoffs were one and done, so the ladies knew to leave it all on the court. #1 LA Aiya faced the #8 Philly Lady Suns in the first QF game. By taking advantage of fast break opportunities, Philly was able to stay within 4 for most of the first half. But by the time the second half began, LA showed the consistency that has made them NACBAIT Champions thrice before. Aiya won the game 52-37. Baby Shaq led Aiya with 17, while Taylor Lee had 9 for the Suns. The 4/5 game is usually the top game of the round. 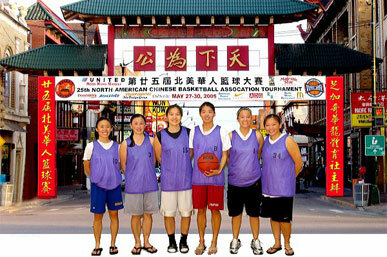 Youngster Carmen Law (11 pts, 2 3's)and guard Ann Ching (14 pts) led the Toronto Dragons as they met the SF ArcAngels. SF featured a smaller, quicker lineup starring Shorty Ty and former All-Tournament selection Irene Wong. With Toronto's rotation seriously impaired by injuries, SF had no problem playing the uptempo game they needed to play. Frisco rolled 56-42. The next game's matchup was a glimpse of the future, as the vibrant Washington CYC China Dolls played against another team with a bright future, Toronto CCYAA A. DC's average age is only 15 years old and Toronto's top scorer Kim Lee (24 pts, 8 rebs)is only a freshman in college, so these 2 teams will certainly be facing each other many more times in the future. On this day though, Toronto was easily the more polished squad and they won 46-30. The Quarterfinals' last game was the new SF Red Coach meeting another new team, Seattle Shibooyah. 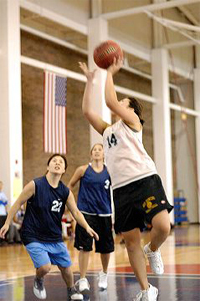 Laurie Lee was the top player for the saavy Red Coach team, as she scored 11 and hit 6-7 ft's to lift her squad to a 55-37 win. On to the Semis. LA Aiya and SF ArcAngels. This was the Finals matchup in both DC and Vegas, so there was definitely a lot of hype for this game and the crowd was packin the stands to watch. LA was really on their A game in the first half, as they hit their open teammates for automatic J's and short gimmes. Kristen Welsh was killer as she shot about 75% for the game on her way to 8 buckets (16 pts), and Alice Wang (2 triples) provided balance by popping strings from long distance. Despite solid games from Rachel Jung and Kathleen Shorty Ty, SF could not overcome the teamwork and defense that LA had. LA won 56-44. Toronto CCYAA A v/s SF Red Coach. This game was reminiscent of the old ESPN Classic game where Dominique Wilkins and Larry Bird were battling it out against each other. The only difference was that this time, their names were Marissa Ling (24 pts, 7-7 FT's, 3 treys) and Cecilia Chan (25 pts, 3 treys). Although both players had great individual games, the difference proved to be the Red Coach defense on CC's 4 teammates. By stopping everyone else, Red Coach was able to win 45-36. Monday morning arrived, and most of the NACBAIT's ladies and gents were still recovering from Sunday Night at Vision's. But SF Red Coach and LA Aiya were there at the gym trying to get at that ship. Both teams were playing their 6th game by that time, and LA was the team who seemed to be suffering more. They came into the Tournament already bruised and battered, and the number of games really had an impact on them from top to bottom. Red Coach certainly took advantage of the situation by getting physical with LA from the opening tap. They prevented LA's top shooter Debbie Young from getting open, and then pressured LA into a couple of completely uncharacteristic turnovers. Red Coach knew that if they got an early lead, then LA's injury situation would prevent them from making a comeback. SF got a double digit cushion in the first half, led by the play of Marissa Ling. Down the stretch, MVP Cassie Chi sank 8-8 ft's to give SF Red Coach the title in their first ever NACBAIT. Much congratulations and we will see you ladies next year in Beantown.